Welcome to my website! I’m so happy that you are taking the time to join us and to take this extra step to support your physical, mental and spiritual enlightenment! Before you jump into all of the good stuff that we have here, I’d like to share with you my story of how I got here and why I’m so passionate about helping you empower yourself with knowledge and tools to heal yourself. I am a Chiropractor’s daughter. I grew up in a household where our medicine cabinets were filled not with aspirin and pain relievers but Vitamin E, Calcium, Homeopathic remedies, and herbal tinctures. In fact, we did not have any allopathic medicines in our home at all. My Dad is an Applied Kinesiologist and Nutritionist as well, so all of our ‘medicines’ were food and herb based. I never went to allopathic doctors growing up, as my Dad was always focused on balancing out the Nervous System through chiropractic adjustments, food, and nutrition. This always worked for us. Then teenager years hit. Late nights, travelling, my parents divorce, eating pizza, trying all of ‘the bad stuff’ that I knew I wasn’t supposed to be doing but following along with the crowd… you get the picture. My energy level plummeted, and I was sleeping every afternoon that I could. With college years it worsened and was at its’ worst as I was finishing off Chiropractic school. I slept 10 hours a night and then 2 hours every afternoon. Then came baby # 1 and baby #2 and with that, subsequent fatigue that resulted in 8-10 hours of sleep, waking up being tired and ready to go back to bed within an hour. Anxiety about how to make it through each day….Naps being a requirement, not being able to do anything after 2 pm because I needed time to lie down and sleep for 2 hours. My brain was thick with fog, my limbs felt leaden weights, and I had constant pain in my hip, my shoulder, itchy patches in various areas around my body. I tried every healer, body worker, herb, supplement that I could. I was already vegetarian and thought that I was eating a healthy diet… and I was. I baked my own bread, ground my own grain for muffins, cakes and cookies, I ate salad and organic cheese on my crackers, I drank Golden Milk and I detoxed periodically. I loved my sweets and breads and ate plenty of cheese and fruit. I had heard about gluten-free and dairy alternatives but thought that it was a bunch of nonsense. But, after years of suffering and trying everything that I could think of, I finally talked myself into taking a week break from all wheat, dairy and sugar (including maple syrup, honey, and agave). Within about 7 days, I started noticing that my thoughts were more clear, my brain was feeling less dense. My body felt lighter and I wasn’t as tired when I woke up in the morning. I was pretty happy with this progress, so I kept it up. That was 2012. Over the years, I have continued my journey working on decreasing my inflammation by working with an awesome herbalist, Dr. Karta Purkh Khalsa, my Chiropractor Mark Jensen, and my Acupuncture friend and colleague, Dr. Japa Khalsa. I ‘cheat’ periodically at friends’ birthday parties, social events or special occasions if there is a food that I really want to eat and enjoy with everyone. But, 98% of the time, I stay away from foods that I know cause my fingers and hands to swell, the itchy spot on my forehead ( random, right?!) to flare up, and my left shoulder to ache. My eyes are bright and clear, I can truly and deeply listen when my patients talk to me about their health challenges, I no longer have anxiety about life, and I love waking up in the mornings to see what the day will bring me. I am sharing this with you because I want you to know that I have been where a lot of you are now. I know what it’s like to be in so much pain that crawling on the floor is the alternative to lying in bed, to get depressed from pain and fatigue, to cry because there seems like there is no help anywhere. I want you to know that there is a lot that YOU can do. You can change your life through diet, mindfulness, movement, breath and elimination. Your doctor does not have all of the answers, although they can be a part of your health team. You have the gift of being your own best healer. Your body has the tools that it needs to heal itself, if it is given the opportunity. With food elimination, adding whole foods, moving, breathing correctly, proper sleep, your body has many of the tools to adjust and balance itself. This is both easy and difficult at the same time. It is a journey that takes commitment. And, I know you all have it in you. In our website we have offered lots of tools and goodies for you to try to start you on your health journey. Just start with one thing and commit to trying it for a week. I know that, if you just start with one thing, you will start noticing some changes. This is why I’m passionate about sending out these ‘quick health tips’: I love to help people and I love people to reclaim their birthright to be happy, healthy and holy. The power is inside of you and is just waiting to wake up and express itself in its’ own, unique way. Just start. Thank you so much for taking the time to visit our site and for taking the time to read my story. I write it to, hopefully, inspire you to find something that can help get you started on your journey toward health and vitality. P.S. 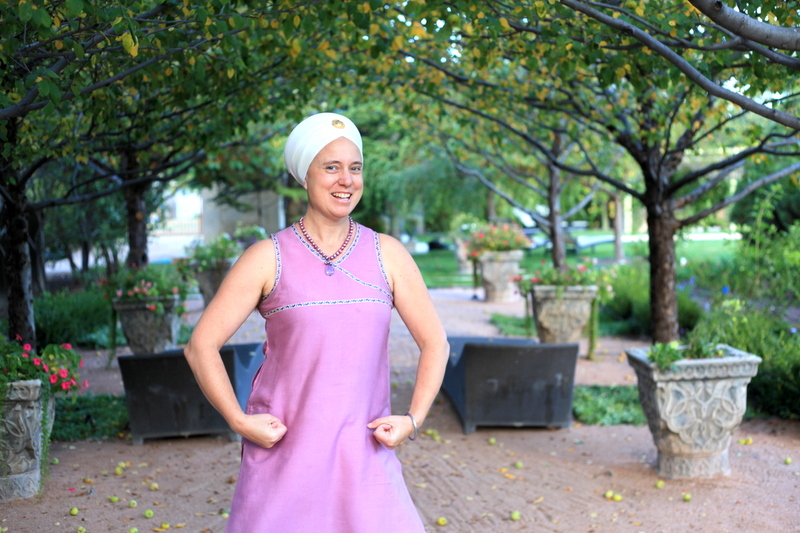 If you are curious about my turban, you can read this other post. Dr. Arjan spent 2 years of undergraduate study at the University of Georgia and then transferred to Life Chiropractic College in Atlanta to complete her undergraduate education. She completed her full Chiropractic degree at Parker College of Chiropractic in Dallas, Texas in 1999. Dr. Arjan has taken the Level 1 and 2 certifications to practice Craniosacral Therapy with the Upledger Institute.